Hi, I got this small white Diorama but I'm not sure if I should keep it or get the medium instead. I don't carry much, just basic stuffs and for this decision, I only care about how the bag looks on me. So what do you guys think? Thanks a lot. I think it looks good on you in this size. Thanks a lot, I bring it out today and it looks cute with my cocktail dresses so I'm gonna keep it for daylight events. YBcozYnot, Greentea and averagejoe like this. I have this exact one but I purchased it in October 2015 in one of the Las Vegas boutiques. This is stunning!!! I called up local boutique to enquire about this red bag but was told it’s chili red. I don’t think I have the time to make a trip down this week. Are there other kinds of red released for this design? If not, it should probably be this! Hi everyone, I'd like to solicit your opinions please! The more I look at it, the more the texturing of the leather annoys me. It looks too rugged for such a delicate bag. The fastener on my brand new bag is totally scratched. The magnetic closure, though very strong, is badly designed in my opinion. It's too 'flat' for the strength of the magnet and when the two sides connect, they scratch each other. I have another WOC from 3 years ago and it does not have this problem. 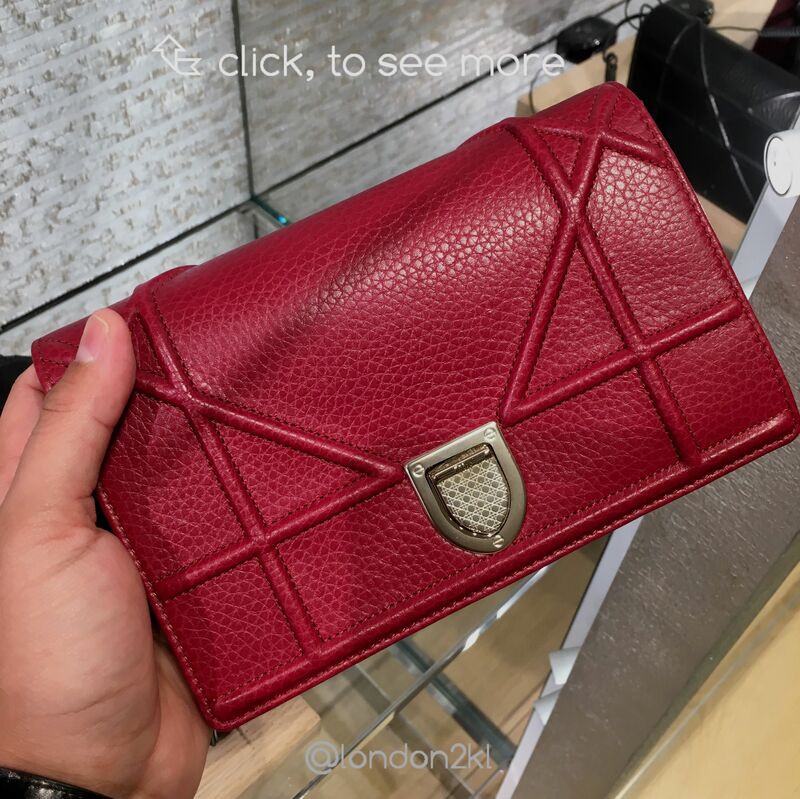 I consider this a design flaw on Dior's part and it really annoys me that the clasp on a $2000 clutch looks like crap after just a few days. I haven't even used it yet! For anyone who's recently purchased one of these, did you get a storage pouch for the chain and a felt liner for the front flap? I got both of these with my old WOC, but not with this one, and it's bugging me because it feels like Dior has cheaped out on my purchase experience. I was initially drawn to the rich cranberry colour but now I think I might exchange it for something else. I'd very much appreciate your input. Thank you! Congratulations on your bags. I love the colors. Like you said, much better than black. I also like your shoes in the first picture with forest green D. Who makes them? The corner wear is pretty much the metallic paint wearing off. But it doesnt bother me. The rest or the bag is just fine. I look at like scuffing to corners of any leather bag. Hi babe, I remember reading somewhere that the peeling issues has been fixed. Would like to know if the metallic paint coming off is still an existing issue because I expect it to be rather hard wearing since it feels like patent. am considering between a grained calf and micro cannage diorama. Thanks in advance! Tasha1, obsessedwhermes, Sylly and 9 others like this.